Give them your tired, your poor, your old Cooke Series II and III Panchros yearning to be breathing free. If you’re looking for a vintage Cooke Series II and III Panchro look, here’s the real deal. 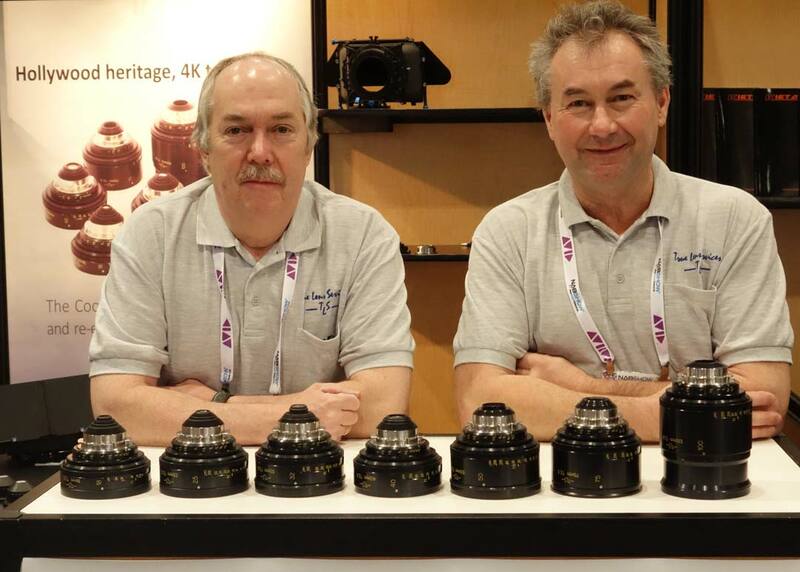 Colin Sanders (right) and Keith Truslove (left) of True Lens Services showed the entire set at NAB of their skillful rejuvenation. Send them your original vintage 1950 Cookes: rehousing them with cam focus and barrels reminiscent of current S4 lenses. Above, revitalized set in PL mount: 18, 25, 32, 40, 50, 75, 100 mm. True Lens Services is down the road from the mother ship Cooke factory in Leicester, with a staff that includes some of technicians who built the original Cooke Series II and III lenses. Gee – that’s interesting – I have a set that Century rehoused ck in the 90’s in a very successful macro conversion – a set of 7 series 2 and 3’s that I sent to Keith for an overhaul 2 years ago. They were there a reeeeally long time before he sent them back, I wonder how similar these new housings will be to my set?